Cells that break away from a cancerous tumor and wander through the body can tell us a lot about the tumor itself, potentially leading to new avenues of research, quicker diagnoses and targeted treatments. The challenge is finding these tumor cells and separating them from the billions of other cells circulating in a person’s bloodstream. Now researchers from the University of Georgia and the Georgia Cancer Center at Augusta University have created a microfluidic device to isolate tumor cells quickly and efficiently, a promising advance that could provide researchers a tool to better understand cancer and lead to simple tests for detecting and tracking the disease. In a study published recently in the Royal Society of Chemistry journal Lab on a Chip, the UGA and GCC researchers say their technology recovered nearly 93 percent of circulating tumor cells (CTCs) for analysis. Existing, similar devices typically recover only 82 percent of CTCs. In addition, those current microfluidic devices depend on tumor-specific biomarkers placed on the surface of CTCs to pull them out of a blood sample. This process is generally inefficient and time-consuming because there may be only one tumor cell for every billion cells. The device developed by UGA and AU researchers uses a different approach. 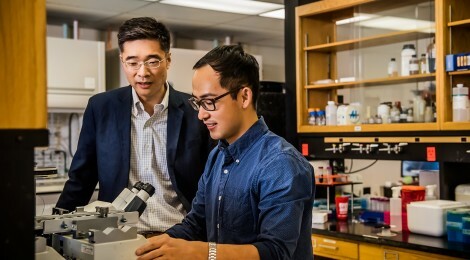 “Instead of searching for and enriching the few CTCs that exist in a sample of blood, we’re taking the opposite approach and eliminating everything we are not interested in— the red blood cells, the white blood cells and other components,” said Leidong Mao, an associate professor in the UGA College of Engineering and the senior author of the paper. 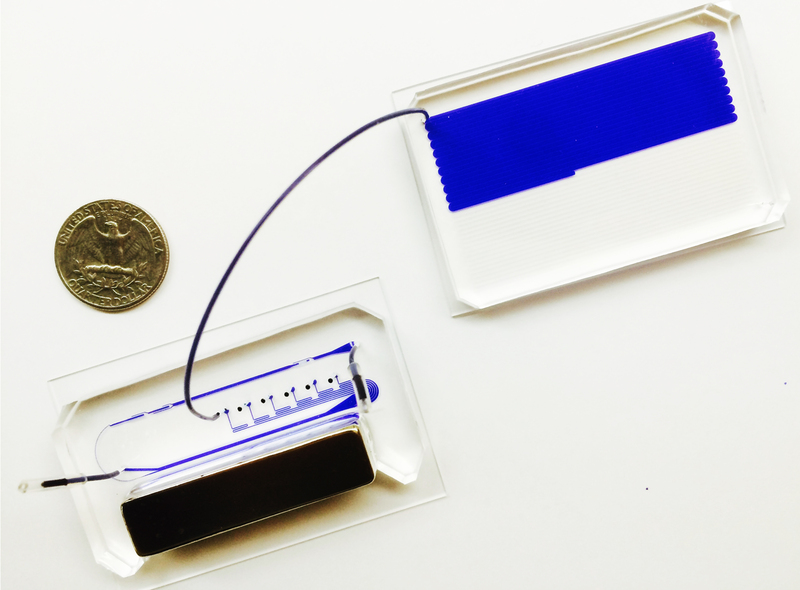 The device works by funneling blood through channels smaller than a human hair. By magnetizing the medium surrounding the cells, the researchers are able to drive cancer cells and blood cells into separate streams based on differences in their size. Wujun Zhao, a doctoral student in UGA’s department of chemistry, served as the paper’s lead author. The research team also includes scientists and students in the department of genetics at UGA, the Massachusetts Institute of Technology and Syracuse University. This paper is included in the 2017 Emerging Investigator Series in the journal Lab on a Chip. The series showcases the best work in the field of miniaturization at the micro-scale and nano-scale level conducted by early-career researchers like Mao. This project is supported by a seed grant from UGA and Augusta University, the National Science Foundation, and the National Institute of General Medical Sciences of the National Institutes of Health.